MOUNT VERNON, Va., April 14, 2011 — Since the begin­ning of the repub­lic, the Unit­ed States has had to bal­ance its ide­al­is­tic impuls­es with real­ism, and that remains true today, Defense Sec­re­tary Robert M. Gates said here today. Gates was the keynote speak­er at the ground­break­ing for the Nation­al Library for the Study of George Wash­ing­ton on the grounds of the Mount Ver­non Estate. 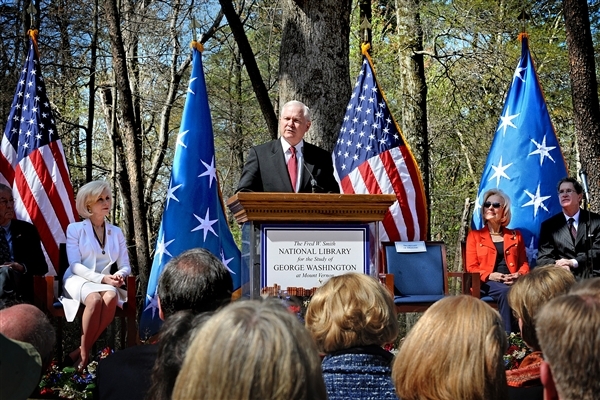 Defense Sec­re­tary Robert M. Gates speaks at the ground­break­ing for the Nation­al Library for the Study of George Wash­ing­ton on the grounds of the Mount Ver­non Estate, Va., April 14, 2011. Wash­ing­ton faced some of the same ques­tions over the rise of rev­o­lu­tion­ary France that Pres­i­dent Barack Oba­ma faces with the rev­o­lu­tions in North Africa and the Mid­dle East, Gates said. Wash­ing­ton became America’s first pres­i­dent in 1789, and he was con­front­ed with the con­se­quences of the French Rev­o­lu­tion. But many dis­agreed, includ­ing Vice Pres­i­dent John Adams. “They were appalled by the revolution’s excess­es and feared the spread of vio­lent French rad­i­cal­ism to our shores,” the sec­re­tary said. Wash­ing­ton had to resolve the mat­ter. “My best wish­es are irre­sistibly excit­ed when­so­ev­er, in any coun­try, I see an oppressed nation unfurl the ban­ners of free­dom,” he wrote. But the upheaval in Europe had begun to dis­rupt the U.S. econ­o­my, and he under­stood the fragili­ty of America’s posi­tion at the time. He “adopt­ed a neu­tral­i­ty pol­i­cy toward France and would go on to make a peace treaty with Great Britain – spark­ing mas­sive protests and accu­sa­tions of sell­ing out the spir­it of 1776,” Gates said. The most suc­cess­ful Amer­i­can lead­ers stead­fast­ly encour­aged the spread of lib­er­ty, democ­ra­cy, and human rights, Gates said. “At the same time, how­ev­er, they have fash­ioned poli­cies blend­ing dif­fer­ent approach­es with dif­fer­ent empha­sis in dif­fer­ent places and at dif­fer­ent times,” he added. The Unit­ed States has made human rights the cen­ter­piece of its nation­al strat­e­gy, even as it was doing busi­ness with some of the worst vio­la­tors of human rights, the sec­re­tary not­ed. “We have worked with author­i­tar­i­an gov­ern­ments to advance our own secu­ri­ty inter­ests, even while urg­ing them to reform,” he said. The world is wit­ness­ing an extra­or­di­nary sto­ry in the Mid­dle East and North Africa, the sec­re­tary said. A theme of Amer­i­can his­to­ry is that the Unit­ed States is com­pelled to defend its secu­ri­ty and inter­ests in ways that spread demo­c­ra­t­ic val­ues and insti­tu­tions, Gates said. “When we dis­cuss open­ly our desire for demo­c­ra­t­ic val­ues to take hold across the globe, we are describ­ing a world that may be many years or decades off,” the sec­re­tary said. “Though achieve­ment of the ide­al may be lim­it­ed by time, space, resources or human nature, we must not allow our­selves to dis­card or dis­par­age the ide­al itself.” Amer­i­ca must speak about its val­ues and ideals, Gates said.